With Christmas right around the corner, we have already been diving into some good books to prepare for the upcoming season. One of our favorites has been A Wish to Be a Christmas Tree by Colleen Monroe. We love its rhyme and message of friendship and acceptance. I wanted to extend the text with a hands-on craft. 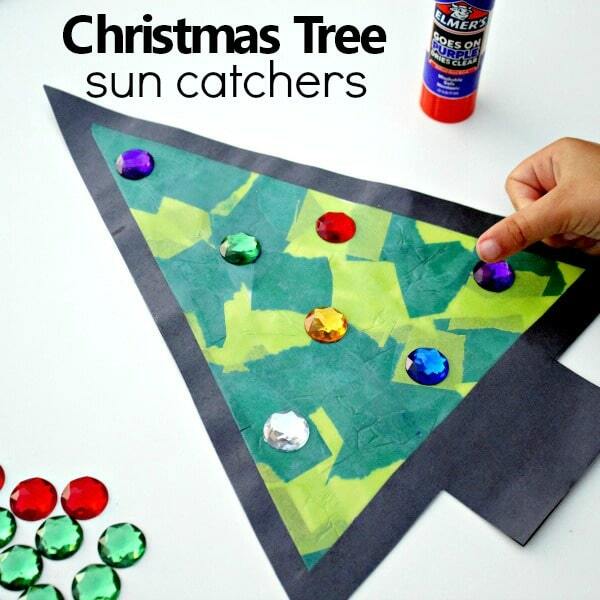 Given that our watermelon sponge painting was a hit, it sparked a great art activity idea for Christmas trees. 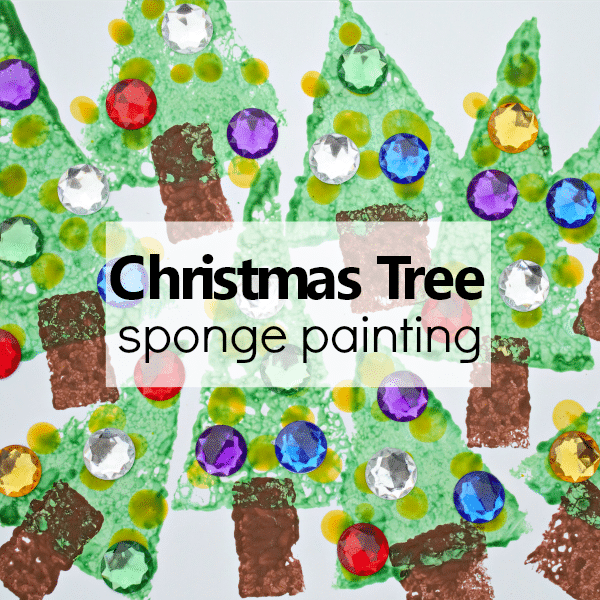 After gathering just a few simple materials, I set up a Christmas tree sponge painting art activity for my preschoolers and they were so excited to get to sponge paint again. 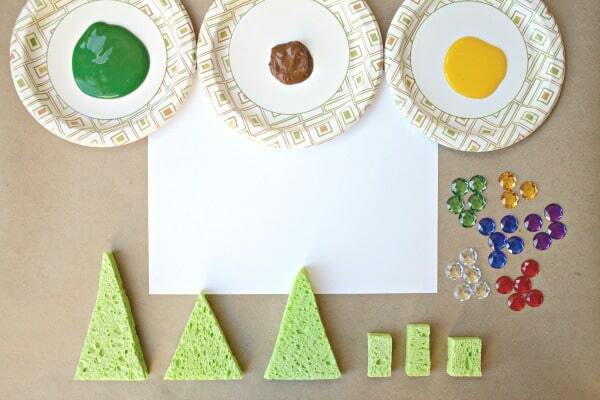 This sponge painting art activity touches on sorting, ordering by size, number sense and a lot of creative process art! For preschoolers, I like for art to be as open ended as possible with minimal parameters on cleanliness. Because hey- you know a little mess is bound to happen! To keep our craft table clean from paint, I chose to use washable tempera paint and covered our work space with some Kraft Paper. 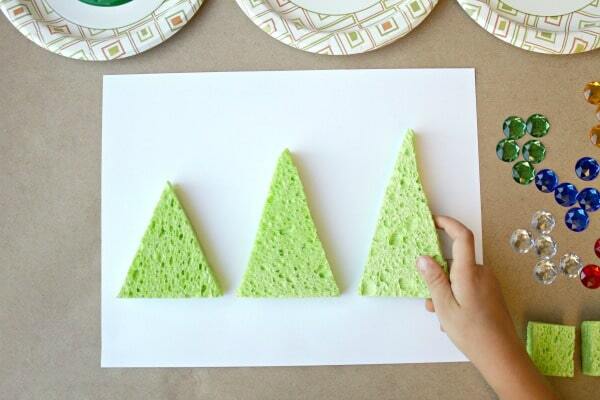 Next, I cut several sponges into triangular and rectangular shapes to represent our Christmas trees and their stumps. Before we got started, we discussed the parts of a Christmas tree and identified the shapes we would use for the body and base of the tree. We then added green and brown paint to some small paper plates. What’s a Christmas tree without lights? So we added in some yellow paint too! I set out some round craft jewels to represent the bulbs and we took the learning opportunity to sort them by color. Some more early math skills were woven into the activity by ordering the sponges from smallest to largest and then largest to smallest. This turned their thinking caps on, as they carefully selected the correct triangular sponges and practiced ordering them by size. 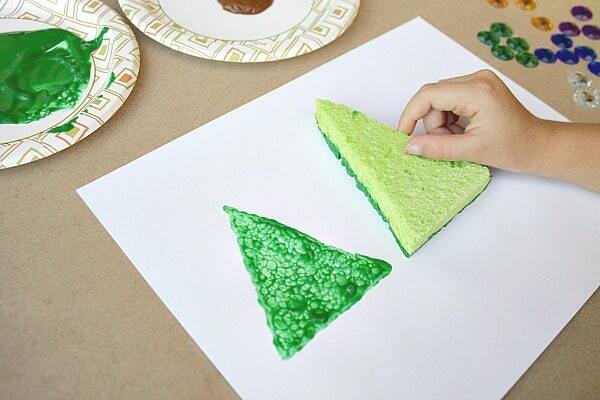 Once the triangles were ordered by size, the sponge painting could begin. Carefully dipping the sponges into the paint, the Christmas trees were arranged by size onto the white card stock paper. 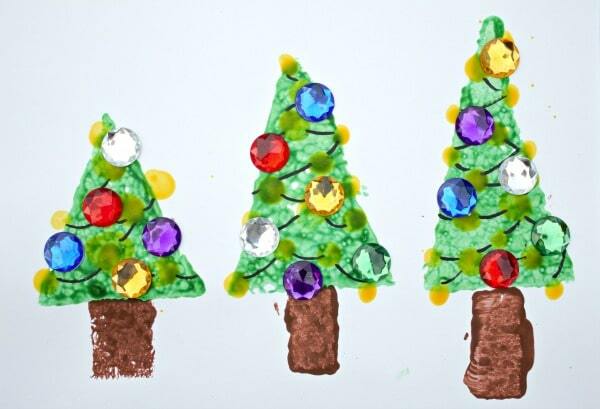 The brown tree stumps were stamped next, and then the fun finger painting could begin! Using fingerprints for the lights was the highlight of the art activity because they got to get a little messy! Once the trees were dry, I used a black Sharpie marker to string the “lights.” This step can be optional or you may allow older children to do this. 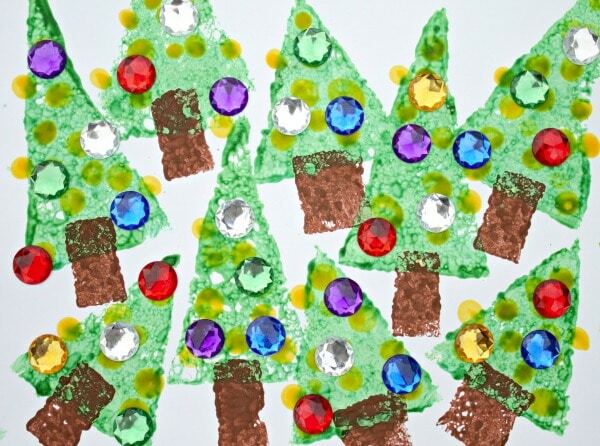 To extend more math into these Christmas tree works of art, you could also practice one to one correspondence by asking how many jeweled ornaments were on two different trees and making a comparison between the two. For example: Which tree has more ornaments? Which has less/fewer ornaments? 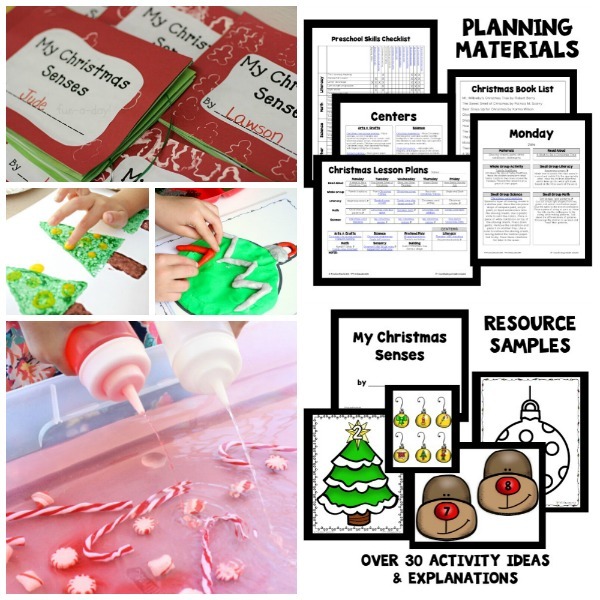 If you’re looking to modify this activity for younger preschoolers or toddlers, you can keep it simple and focus on just shapes, colors, sorting, and stamping. 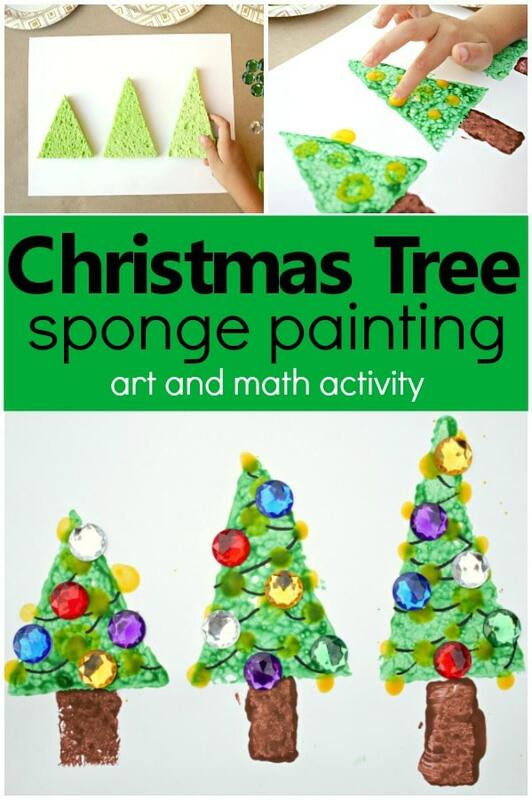 This Christmas tree sponge painting was such a hit that I also set it up as an open ended process art activity. 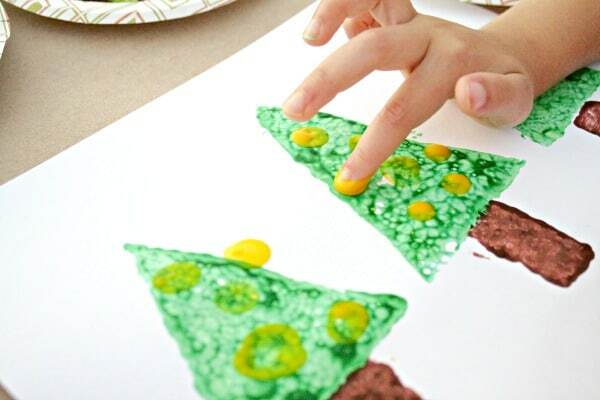 Child led art can be a fun way to inspire creativity and encourage conversation. My little artists described their process art as the forest of trees where everyone goes to look for their Christmas tree, just like the book. I just loved watching the “Christmas tree forests” come to life! I love it when a book comes to life through art. 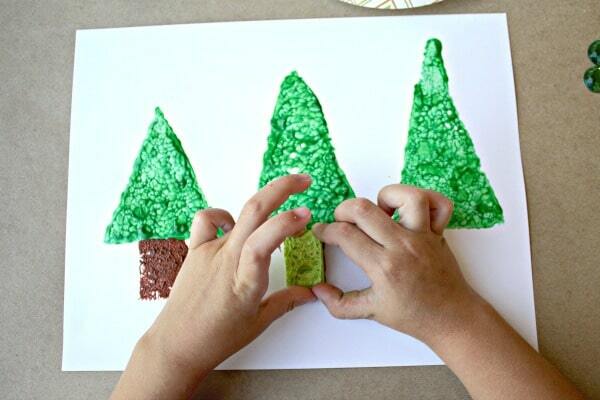 We hope you enjoy making your own sponge painted Christmas tree forest! 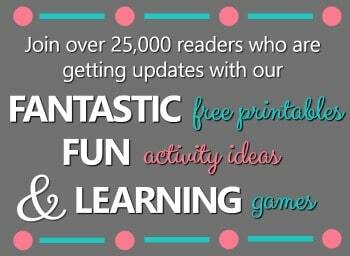 Help kids practice number recognition with our Free Printable Number Matching Activity. 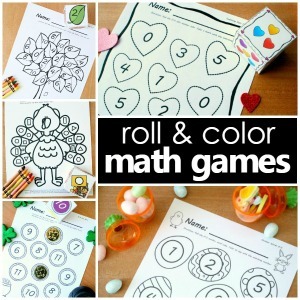 Need to focus on different math skills? 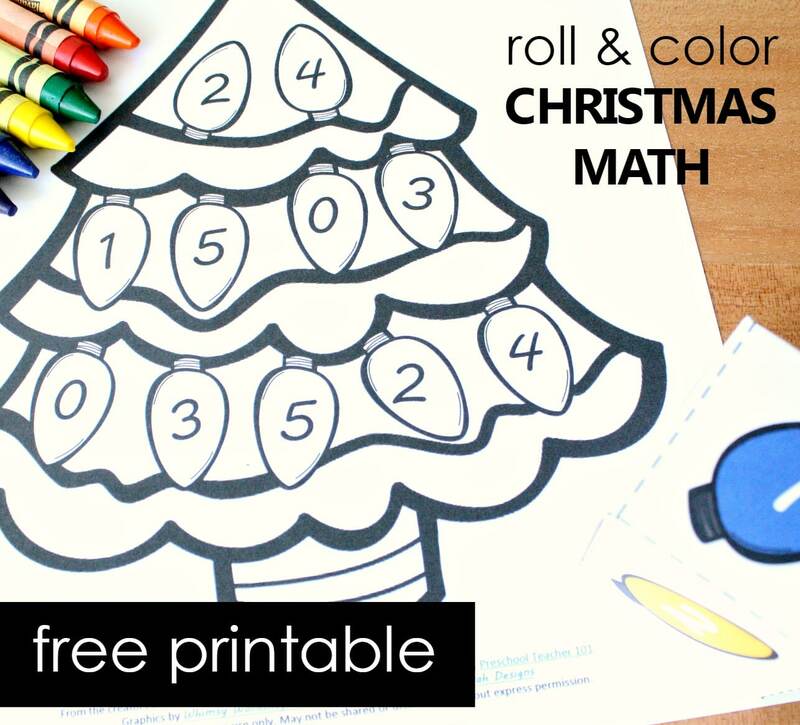 Check out the Full Christmas Tree Roll and Color Set.